The entrance to Sedlec Ossuary. Image credit: Tyler Nofziger via Wikipedia. The Sedlec Ossuary is a charnel house filled with the remains of an estimated 40,000 people. 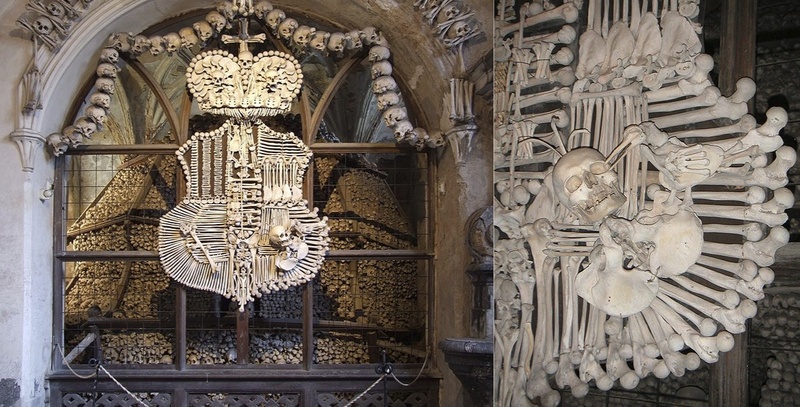 This “bone church” is famous for its macabre human bone decorations that fill every corner of the building. Although impressive today, the intricate décor of Sedlec Ossuary has evolved over several renovations. In 1142 a Cistercian monastery and an adjoining cemetery were founded near where the ossuary currently stands close to Kutná Hora, east of Prague. At the end of the 13th century the abbot of Sedlec brought back soil from Jerusalem to consecrate the grounds of the monastery and the burial ground. The cemetery at the Sedlec monastery became a very popular graveyard throughout Central Europe because it was blessed with the soil from the Holy Land. The cemetery was expanded after plague epidemics in the 14th century and the Hussite Wars of the 15th century drastically increased the area’s population of corpses. After 1400 one of the Cistercian abbots had the Church of All Saints built in the middle of the burial ground. A charnel house was constructed in the basement of the church to store exhumed bones from the cemetery so the graves could be recycled. Sometime after 1511, a half-blind Cistercian monk was tasked with organizing the gruesome clutter – he was one of the earliest people to arrange the human bones at Sedlec. The monk constructed six large human bone pyramids, four of which still stand today. According to Paul Koudounaris, the pyramids were meant to symbolize a “heavenly mountain” that is “topped with crowns that symbolize the Kingdom of God.” The charnel house was renovated again between 1703 and 1710 by a Czech-Italian architect by the name of Jan Blažej Santini-Aichel. The House of Schwarzenberg acquired the monastery and cemetery in the late 18th century when Emperor Josef II ordered hundreds of monasteries sold off to secure control over the Catholic church in the region. The family kept the ossuary but turned the rest of the property into a tobacco farm. In 1870 the Schwarzenberg family funded another renovation of the charnel house that resulted in the bone church’s current design. The family hired a woodcarver named František Rint to revamp the ossuary and create sculptures using human bones. Rint kept four of the six bone pyramids in the basement built by the half-blind monk. He cleaned and repurposed the human remains from the other two pyramids for sculptures that decorate the rest of the church. The most striking of Rint’s “skull”ptures include huge chalices, a chandelier, monstrances, and a recreation of the Schwarzenberg coat of arms. One of the bone chalices on either side of the entrance to the main room at Sedlec. Image Credit: Chris Waits on Flickr. In two niches on either side of the entrance to the main room are gigantic chalices made of human bone. They are constructed with femurs, pelvic and sacral bones, and topped with skulls. In the center of the main room of the church is an eight-foot-wide chandelier made from human bones. It is rumored to contain one of every bone from the human body. A monstrance is a chalice used by Catholic churches to display the Eucharist or communion wafer during the sacrament. There are two monstrances (pictured here) made of human bone next to the main altar. 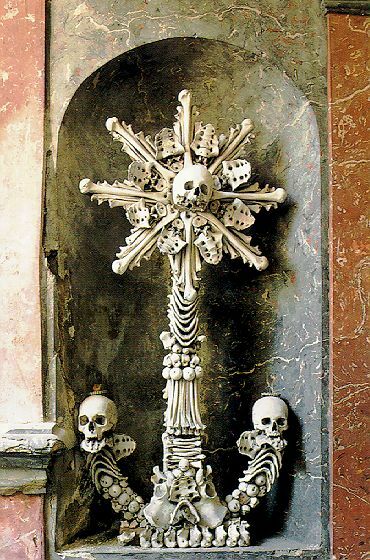 At Sedlec, the communion wafer is replaced by a skull with femurs radiating out of it. The monstrance was assembled using skulls, arm and leg bones, as well as pelvic and sacral bones. The Schwarzenberg coat of arms recreated with human bones. Images from Wikipedia. Rint built a detailed reconstruction of the Schwarzenberg coat of arms using human bones, which is attached to the grate in front of one of the bone pyramids. The Schwarzenberg coat of arms consists of silver and blue vertical stripes, a silver tower on a black hill, three red spikes in a green field, and a burning twig. There is also a raven pecking out the eyes of the head of a Turk to commemorate the victory of Adolf von Schwarzenberg over the Ottoman army in 1598. RInt used a human skull for the head of the Turk and fashioned a raven using the bones of a hand and wrist that were fused by arthritis. František Rint’s signature in human bone at Sedlec Ossuary. Image Credit: Wikipedia. Like any artist, Rint signed his masterpiece but in this case he left his mark in human bones. The parish started restoration work on the All Saints Chapel and the ossuary in 2014. Below is a video (found by @BessLovejoy) of the project.